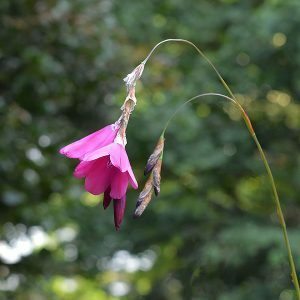 Dierama pulcherrimum are a graceful plant with flowers appearing on the end of long stems also known as Fairy Wands and Fairy Fishing Rods. A native of South Africa and flowers from spring through to summer. D. argyreum is a smaller growing species. D. pulcherrimum has large flowers of a deep purple. Dierama erectum is more upright as the name implies. With 40 – 100cm arching stems dierama have flowers of pink, purple or white pendulous bell shaped flowers above grasslike evergreen foliage, being tall with good flower spikes these plants can make a dramatic impact in the garden. D. luteoalbidum is a lemon coloured variety. Dierama ‘Blackbird’ is a deep maroon variety. D. pendulum is an evergreen species. Preferring full sun and a well drained humus rich soil. Dierama will multiply into a clump and with some watering in the hotter periods will perform well in the garden.